Soft proofing and ProPhoto please! I really want to stay with DXO Photolab! Please add soft proofing capabilities and ProPhoto space to Photolab! If Adobe can do it…DXO can. I spent a couple of years chasing AdobeRGB on my cameras and computers and then trying to get prints printed well to match. Didn’t improve my photography at all and ended up with some horrid online versions of my work and changing colours between different photo applications. Total nightmare. At some point it all has to be converted back to sRGB for printing or online presentation. Since I made peace with sRGB in all my cameras and applications, life has become much simpler and my photographs look consistently good across all platforms and print very well. I’m not sure these alternative colour spaces are worth the trouble to be honest. I don’t think DxO should support more than what an OS (Mac or Windows) supports natively. Colour spaces are an endless rabbit hole. Too bad, that these “things” turned out so badly for you. I do not plan to chase AdobeRGB on my camera. I’m shooting RAW. Always have and always will. Do you shoot Jpeg? For online presentation sRGB is probably your best bet. Agree with you. But…printing?? Don’t think so. I’ve seen enough evidence that printing can be much better than “very well” from sRGB. Why limit your space before you even start? I agree, that doing everything in sRGB is probably the easiest way. But so is shooting with an iPhone and more things in life. I’m striving for the very best IQ when photographing . Best input/ best workflow (IQ wise) / best output. For me, comprehending all facets of a colour managed workflow isn’t exactly easy, so I still have a lot to learn! But I’m eager to! At the moment I work on an iMac. This year I’ll buy a new computer. That might be a Mac mini 2018 (not sure yet). In that case I’ll buy a wide gamut Eizo screen also. By the way…as I understand, DXO uses AdobeRGB. Adding soft proofing and ProPhoto to Photolab wouldn’t hurt anyone and would help many photographers a lot! Of course I’m not shooting jpeg. There’s only so many development hours in the month. The DxO PhotoLab dance card is overfull already. Soft proofing is not a core functionality of PhotoLab and is available in many other applications to which DxO users have access (any old standalone version of Photoshop for instance). If there’s an OS hook which PhotoLab can grab to add effective soft proofing, yes, why not. Don’t forget that PhotoLab is a cross platform application so soft-proofing may turn up in either Mac or Windows, depending on what’s exposed in each OS. Best input/ best workflow (IQ wise) / best output. Those are just words. As I mentioned, adding complex colour space changing routines are more likely to end up in extremely poor prints for most photographers, strange colours in their online images and endless complex support headaches for DxO. For me, comprehending all facets of a colour managed workflow isn’t exactly easy, so I still have a lot to learn! You don’t even understand that for which you are asking. I took the trouble to learn everything there was to know about colour spaces, experiment with photographs in multiple colour spaces, printing at multiple mid to high end labs and check the results. Sticking to sRGB for output ended up with results as good as any other process and far fewer headaches. There are a lot more effective places to spend our energy in improving our photography than fiddling with colour spaces. Accurate sRGB output and prints is a substantial enough challenge on its own. Calibration is the main challenge. Let me know when you have all your monitors evenly colour calibrated to the point you can’t tell the difference between them. I’m there, most of the time, although occasionally a monitor will slip out of whack due to some accidental change to the hardware buttons or a video card misidentifying as I switched which display port output was hooked up to the video card. I wish I could downvote this feature request but Discourse does not allow downvotes. Thank you uncoy / Alec Kinnear. Good to read, that you are happy with sRGB for output and that you find the results as good as any other process. By the way…I only use 1 (one) monitor. No need to have “all my monitors” evenly colour calibrated. You assume quite a lot in this statement. I strongly disagree with you here. Don’t forget that PhotoLab is a cross platform application so soft-proofing may turn up in either Mac or Windows, depending on what’s exposed in each OS. Are you serious? The same can be said about the functioning of any module there is in PhotoLab. adding complex colour space changing routines are more likely to end up in extremely poor prints for most photographers, strange colours in their online images and endless complex support headaches for DxO. Again, you make a lot of assumptions based on what you feel comfortable with. Why do you project your needs onto the needs of “most photographers” and “most DxO users”? Sticking to sRGB for output ended up with results as good as any other process and far fewer headaches. That’s a gross simplification. Just take a look at the gamut comparison of sRGB vs. the gamut of the printer you use and this should give you an idea how much you compromise your output when sticking to the smallest common denominator. And no, Adobe RGB cannot contain the gamut of that profile either. Anyway, if PhotoLab is advertised as a professional raw converter it should contain such pro features as soft-proofing: after all Lightroom, Capture One and even more cross-platform applications such as darktable or RawTherapee have no problem with including this. The fact that you see no need for it does not negate the fact that there are many users who would like to have it. Moved my vote from Add ProPhoto colour space as a "working color space" to here, because it matches more, to what I have described at the end of the discussion there. Dealing with color spaces makes more sense, if you can soft proof them against each other. The fact that you see no need for it does not negate the fact that there are many users who would like to have it. Most users shouting about colour spaces and the limitations of sRGB don’t even have calibrated monitors, Sankos. Wide gamut colour spaces until they are properly built into the OS are a Holy Grail feature. Thousands will die in the quest but the Grail will remain elusive. I’d like to hear about your camera to print path stage by stage, along with budget. I buy $1000 monitors and the wide gamut colour space is compromised. Monitors which will get the job done properly here are already in the $3000 category. If your monitor or OS can’t keep up there’s no point to wide gamut. And then your print shop has to be able to keep up as well and not make a mistake when converting the colours. Advertising agencies manage CMYK colour spaces effectively for print. I’d genuinely like to see your specced out and priced realistic path to a 60cm x 40cm high quality wide gamut colour print. @mujabad Do you have a hardware calibration system yet? If so, please share what you are using. Without hardware calibration, wide gamut colour spaces will generate even worse results than uncalibrated sRGB. 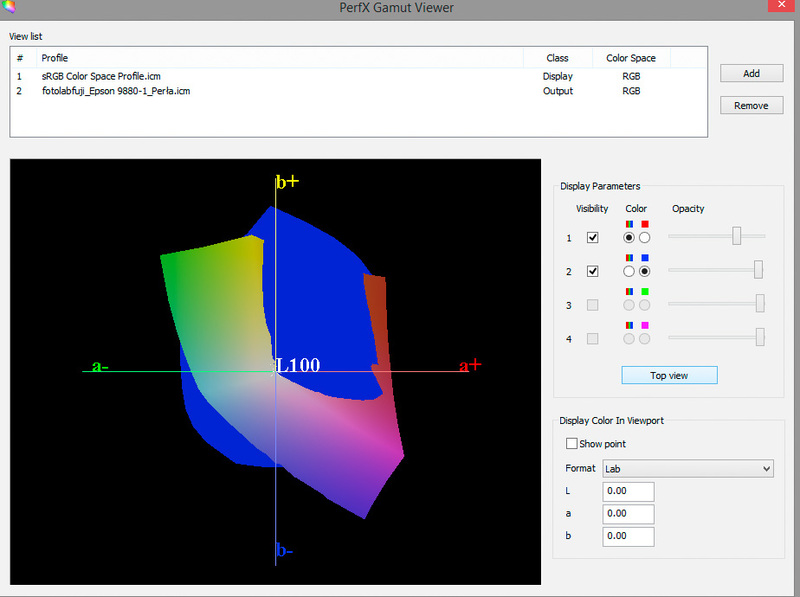 – PhotoLab will apply demosaicking and convert the RGB values from the “native color space of the camera” into AdobeRGB. – PhotoLab will apply any color adjustments (saturation, HSL, but also FilmPack color rendering if you happen to use that, etc.) in that color space. I call this “working color space” because it is the color space PhotoLab does most of its work in. I am quite horrified to have here the certainty that DPL uses AdobeRGB as workspace !!! I don’t understand this choice so restrictive, many other software either allow to choose the workspace, or use a very large linear space in 32 bits or floating point. This allows the least possible loss in subsequent calculations. You probably know that the characterization of an apn can easily exceed the gamut of ProPhoto in some parts, and even more AdobeRGB. The reduction to AdobeRGB leads to unrecoverable losses. Above, some comments speak a lot of output on screen or paper but it is not the most important. Firstly, the gamut of an ink / paper couple can exceed the A98 in cyans and yellows. Secondly, in pro environments, images often go into a bitmap editor to finalize heavy editing that a raw converter can not do. In this case, exporting from DPL in 16 bits in a large colorspace is completely illusory since we have no better than the A98! It’s for me, for a pro work, completely redibitory. Moreover, the gamma 2.2 or 1.8 of the A98 or ProPhoto are also not the best choice and I hope the internal workspace used in PL is linear … otherwise it would be the worst mistake. Wide gamut colour spaces until they are properly built into the OS are a Holy Grail feature. What?? The Windows OS has several deficiencies when it comes to supporting wide gamut spaces for various elements of the system, but that doesn’t mean that PhotoLab, or Lightroom, or Photoshop cannot be used professionally on this system. They can, and they are because they use their own CMS. PhotoLab actually has even some support of Windows-only WCS, unlike most other photo applications (including those by Adobe). If your monitor or OS can’t keep up there’s no point to wide gamut. If that were so, then all DxO PhotoLab users who have regular gamut monitors shouldn’t use the converter because its working space is Adobe RGB. Is that what you are saying? What I’m saying is that DxO does not have to provide the soft proofing environment. There is existing software like Photoshop (including CS6 which has no renewal fees) or Affinity Photo could handle the soft proofing part for those who need and use soft proofing. If PhotoLab were not cross-platform, hence requiring developing and maintaining advanced CMS and soft proofing tools for both Windows and Mac, I’d be keener to see DxO take on soft proofing. Soft proofing is a great feature and on missing. Personally I’m keener to see performance improvements like real time sliders and enhancements like luminous masking first, as other applications cannot carry part of the workload for performance. DAM can be handled by external applications like FastRawViewer and soft proofing by external applications as well. Without all of these conditions being met and just sharing one’s work on the internet, there’s absolutely no point at all in soft proofing. I have a hardware calibrated monitor (100% sRGB, 98% Adobe) and the print company is use for prints specify all files to be sRGB. I soft proof using Affinity and the icc profiles supplied by the print company for the papers they use. So far, it all works fine as a process. I would much rather have luminosity masking as that has the potential to impact every image that I work on. Soft proofing only matters when I physically print which isn’t that often. Neither a DAM nor Soft Proofing even come close to making my wish list. Thanks for sharing your exact process TillTheEndofEternity. That’s about my setup. And I expect that most of us using hardware calibration and printing are about where you are. Curious about others too.